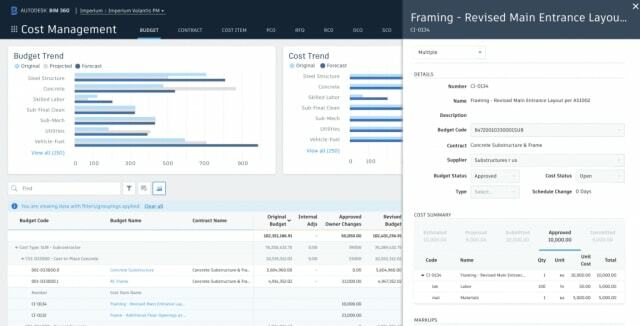 At Autodesk University’s Connect and Construct Keynote Nov. 12, the company announced it had added cost management capabilities to its BIM 360 platform. The company initially announced its revamped BIM 360 platform at last year’s AU. The redesign was meant as an all-in-one workflow connecting all its BIM 360 products on a single platform and environment in whichpartner companies could create accessory software in what the company calls a “software ecosystem.” Since the initial announcement, it has added 60 more software integrations from partners, diversifying what users are capable of through the platform. This year, the company announced the addition of a Cost Management application that will let users manage all of a project’s financial information in a single piece of software. The connected environment will give users a better idea of the overall financial health of the product, reducing decision-making risk. “Together, we’re delivering technology that supports key construction workflows by centralizing project information for all stakeholders and opening the door for innovation through greater access and analysis of project data,” said Jim Lynch, vice president and general manager of Autodesk’s Construction Business Unit. While not much is known about the new application at the time of publication, Autodesk has announced that it will be offered as a limited availability pre-release in December 2018.